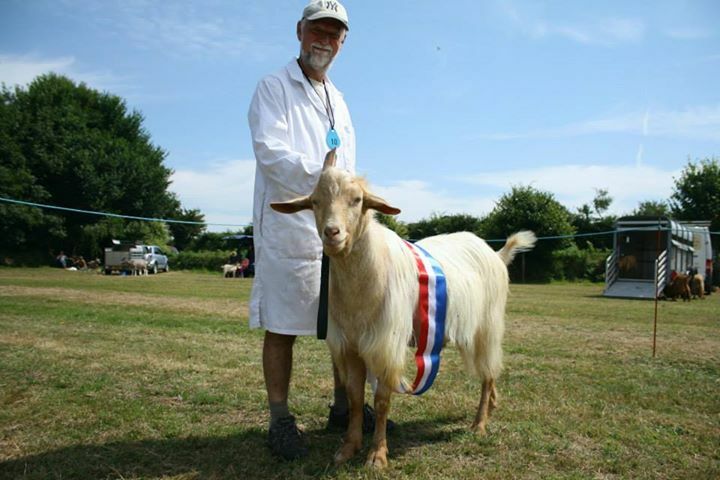 Showing goats for competition purposes is a fun & rewarding way of presenting your prize animal for everybody else to see. The Young Stock Show is for all goats over six weeks and under 2 yrs of age. The Annual Show is for anything over six weeks old and there are various classes, depending what you own that you can enter. 10 Female and 2 progeny. The latter need not be owned by the exhibitor. 11 Male and 2 progeny. The latter need not be owned by the exhibitor. 12 Group of 3 goats, at least 2 of which must be female, and all owned by the exhibitor. Practice walking with your goat before the show: Even a well-trained goat may be a little nervous during the show because of unfamiliarity with the show ring, but if you lead-train first, at least the goat has an idea of what you expect. Thoroughly clean and groom your goat before the show: Buy your goat a nice, clean collar. Trim your goat's hooves so that the judge can see that she walks correctly and doesn't have defects of the foot or leg. Bathe and comb and/or clip your goat according to the standard for that type of goat. 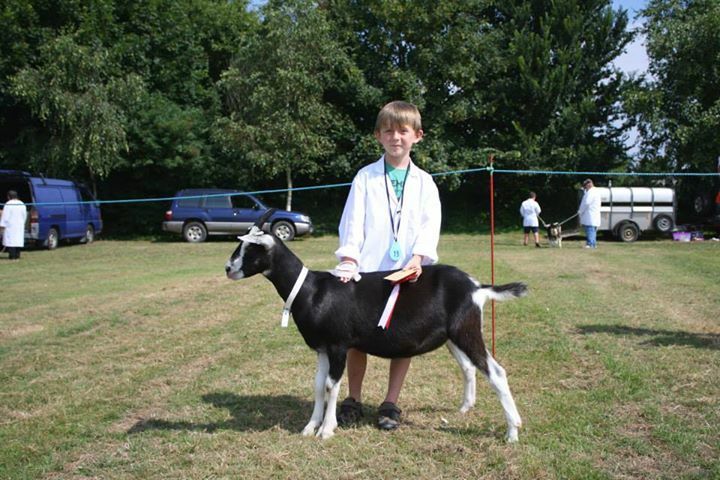 Dress appropriately: Most goat shows require you to wear certain clothes when showing your goats. You won't be barred or removed from a show for wearing other clothes, but if you're being judged on showmanship, you'll lose points. Keep your goat between you and the judge: To change the side of the goat you're walking next to, do a roll turn. 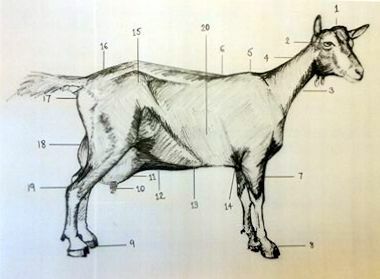 If you're walking clockwise with the lead in your right hand, just before you get to the judge, turn around the front of your goat and change to your left hand. You can reach over your goat to set the legs that are on the far side from you. Always set the legs closest to the judge first. Move to the front of your goat when the judge views the goats from the rear. As the judge moves to the right side and around to the front of the goat, move to the goat's left side, keeping him between you and the judge. When the judge is in front of the goat, remain on the goat's left side. Keep your eyes on the judge at all times: The judge will tell you what you need to do and may ask questions about your goat. If you're distracted, you might lose track of what's going on. Don't talk with your neighbor: Talking with the person next to you while the judge is thinking about placements, comparing goats, or examining each goat is considered rude and distracting. Remain calm even if your goat is misbehaving: Despite being trained, your goat may get bored, scared, or just ornery and misbehave in the show ring. Don't ever hit the goat or treat it roughly. Do what the judge asks: You will start by walking the goat clockwise around the ring. Keep your goat under control with her head up, and keep her between you and the judge. If your goat doesn't want to move, gently lift the goat's tail. When the judge asks you to stop walking, set your goat up in a straight line, facing the same direction as the other goats. Stand or squat on the goat's other side or near her head. Stay alert for another request and keep the goat set up. Keep your goat properly set up: Make sure that your goat's weight is evenly distributed. Don't splay the legs. Set up a dairy doe so that you can see a third of the udder in front and a third behind the back leg. Set up the rear legs first and then the front legs. Hold the goat's head up. Make sure his front legs are straight down from shoulders. Be a good loser (or winner): After judges determine rankings, they explain their reasons for awarding placements as they did. Listen closely to those reasons. Regardless of your placing, congratulate the class winners and other goat owners who placed ahead of you.